An adult brownie that is not too sweet but will satisfy any sweet tooth. 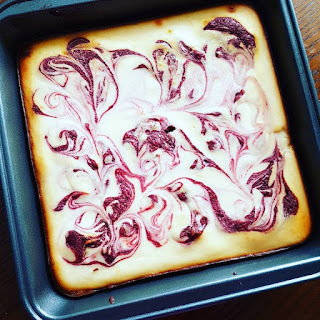 These brownies are as pretty as they are delicious. Enjoy! 1. Preheat the oven to 350 degrees F. Butter and flour a 8 by 8-inch baking pan and line the bottom with parchment paper. 2. Brownie layer: In a large bowl combine the butter, the sugar, vanilla, brandy, cocoa powder, salt, food coloring, and vinegar, in that order, mixing between additions. Whisk the eggs into the cocoa mix. Fold in the flour until lightly combined. Stir in the walnuts and pour the batter into the prepared baking pan, saving 1/4 cup of the batter for the top. 3. Cream cheese layer: Blend together the cream cheese, sugar, egg, and vanilla in a medium bowl. Gently spread the cream cheese layer on top of the brownie batter in the pan. Dollop the remaining brownie batter over the cream cheese layer. Using a skewer or the tip of a knife, drag the tip through the cream cheese mixture to create a swirl pattern. Bake the brownies for 30 minutes. Remove to a cooling rack and allow them to cool completely before cutting.